Earlier this week, MK College’s in-house commercial salon, The Graduate, played host to the second and final set of heats for this year’s Barber of the Year contest. 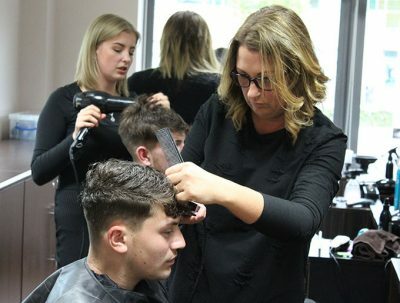 This year’s competition, which includes categories for professionals and students, has seen the net cast further than ever before, with top stylists from across Beds, Herts and Bucks taking part. Following the completion of this year’s heats, all the finalists have now been chosen ahead of the finals. As in previous years, the live finals will be taking place as part of MK College’s spectacular event, Festival in the City, taking place at centre:mk’s Middleton Hall between Thursday 15th June and Sunday 18th June. The Barber of the Year finals will be the main attraction on Sunday 18th June, starting with the student final at 12pm, followed by the professionals at 1pm. Before the winners are crowned in both categories, event sponsors Wahl and Chris & Sons will be involved in a series of demonstrations and activities on the main stage, showcasing their outstanding range of products and expertise. Entry to Festival in the City is free of charge, offering and exciting and immersive mix of performances, exhibitions and displays, showcasing the wide range of talent from across the College. Find out more here: https://festivalinthecity.co.uk/. Alternatively, check out The Graduate salon, located at MK College’s Bletchley campus.